The Lao Government and Viet Phuong Group (VPG) of Vietnam on September 11 signed a contract for exploiting and processing bauxite ore and building an alumina factory in Sekong province of Laos. 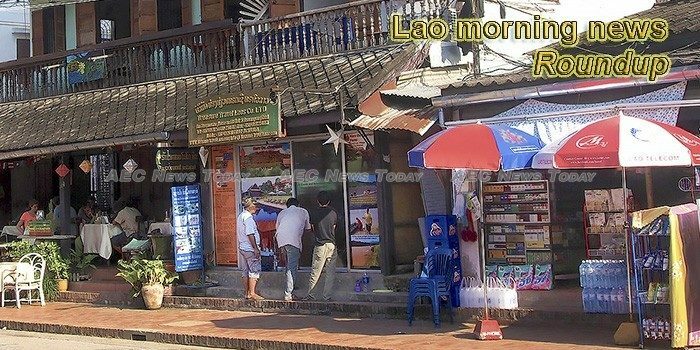 The body of a man was recovered from Huaythahao Lake in Kaenghaed village, Xaybouly district, Savannakhet province, on Sunday, while another man is still missing and presumed drowned. Black T-shirts with a “separatist movement” symbol seized from a vendor came from a single source in Laos, a group of Thai anti-monarchists fleeing prosecution for lese majeste, according to Deputy Prime Minister Prawit Wongsuwon. The government will not consider new investment proposals from businesses wanting to set up fuel import/export operations, a senior official at the Ministry of Industry and Commerce official has said. Serving as South-east Asia’s most iconic waterway, the Mekong River is the lifeblood of the countries it flows through. Officials said the extent of the floods would have a long-term impact on food security projects as well as hinder efforts to boost agricultural production. What can we do to support intellectual property rights? The end product of human innovation is recognised through intellectual property rights, which are accorded to the individuals and groups who use their creative qualities to create a product that is unique and should not be reproduced or copied, especially for the purposes of sale. The Lao Fashion Week, known as the most prestigious international fashion event in Laos, helps push the Lao fashion towards international stage.